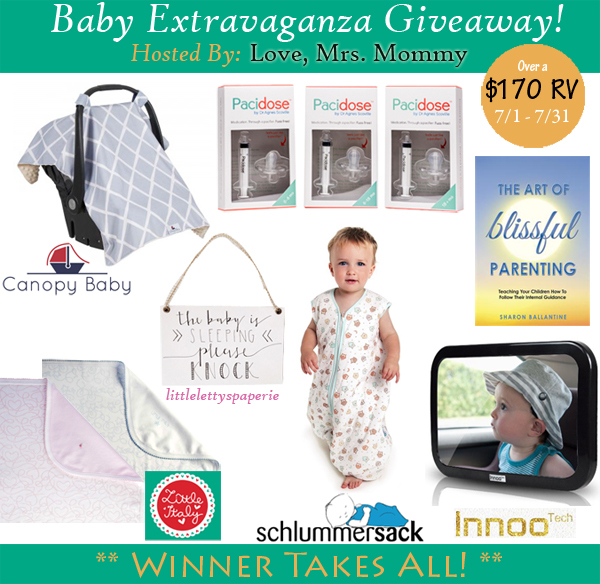 Love, Mrs. Mommy: Baby Extravaganza Giveaway! Over $170 in Prizes! Plus, 4 out of the 7 prizes are Winner's Choice! The Art of Blissful Parenting Book: What if you had the ideal relationship with your children? This book is for every parent that wants to have a powerful bond with their kids. Parents have the opportunity for newfound freedom and joy when they teach their children about their Internal Guidance System. Tools and guidance are offered in this book for exacting the art of blissful parenting by practicing alignment. This paperback book will be signed by the author! Baby Car Mirror: With this mirror, you can easily keep an attentive eye on your children. This mirror offers a large and clear view at 11.8" wide and 7.4" in height. It has a shatterproof acrylic glass and is encased within a curved ABS plastic housing. There are durable and adjustable nylon straps with two adjustable clips so the mirror can be easily and quickly installed to the headrest and moved from car to car. You also will receive 2 bonus items: a "Baby in Car" sticker and cleaning cloth!